Not only does a customer want their project to be completed on time, they also expect their bills to arrive on time. Billing cycles are shortened when all charges are entered in a timely manner so invoices can be generated on a regular schedule or as needed to meet the expectations of your customers. If you are integrating Beyond Software’s Accounts Receivable with the project applications, you can invoice from within project invoices and receive payment within Accounts Receivable, eliminating the need for double entry. This allows you to shorten the time from billing to payment. Beyond Software’s Accounts Receivable functionality helps you automate your receivables management and improve collection times. Easily manage your customer accounts and monitor receivables with detailed information and reporting. From document entry to customer billing and receiving payments, your customers’ balances are kept up to date for accurate reporting or lookup at any time. Customers are available for projects to be defined, when the project applications are also being used, eliminating the need for double entry. You have the option of printing invoices directly from Accounts Receivable or from within Project knowing the customer’s account will always be updated correctly. Out of the box reporting and consoles allow easy lookup of customer records or auditing to quickly answer customer inquiries. Definition of unlimited number of customers, customer classes, terms, statement cycles, aging categories and credit cards. Lookup of customer activity and drill down to the original transaction for any Receivables document to trace the flow of a transaction through the system when needed. You to quickly and easily conduct powerful reporting on customer activity with flexible reports and consoles that provide relevant insight into your Accounts Receivable process with the option to export the data to Excel for further analysis. Application of customer payments to applicable invoice(s). Calculation of finance charges automatically based on your configuration. You can set up an unlimited number of customers in Beyond Software. Ability to define credit card type/number, customer classes, terms, statement cycles, aging categories that match your business processes. 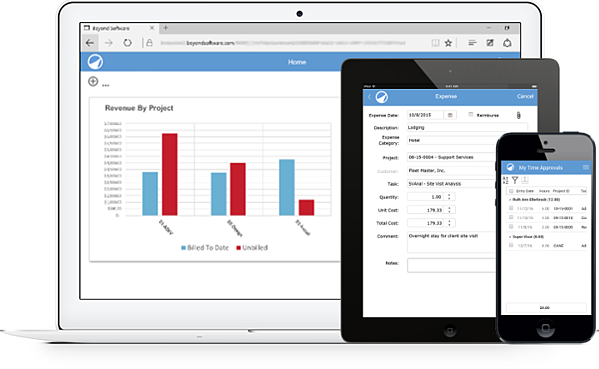 Enter customer invoices, recurring invoices, adjustments, and payments with ease. Ability to assess finance charges as needed, with access to a comprehensive view of customer history. Beyond allows you to easily create payment corrections on an as needed basis. Reverse an invoice with a click of a button. Once corrections have been made, easily re-issue the invoice. Ability to drill down to the original transaction for any Accounts Receivable document. Standard reports for Customer Statement, Customer Trial Balance, Aging Report, Customer console, and Customer Activity console.